The weather in Stockholm has several sides to it. 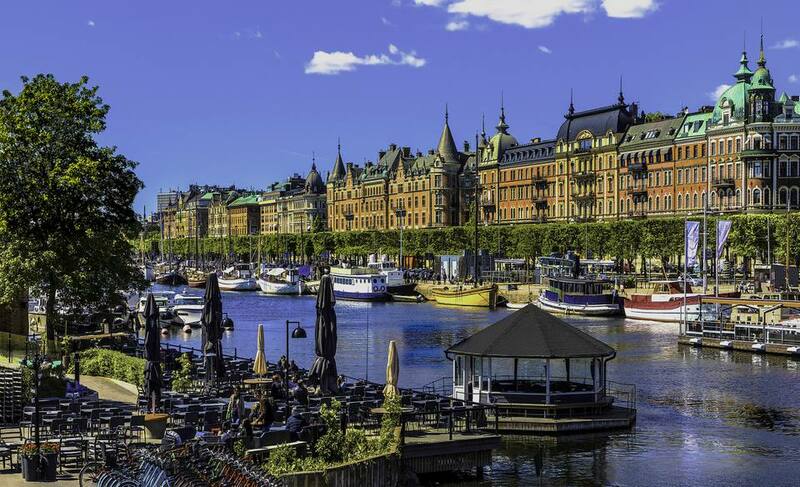 Luckily, Stockholm is located on the protected southeast coast of Sweden, where the Baltic Sea meets Lake Mälaren. As such, Stockholm is shielded from the worst of the arctic weather by the mountains of Norway, so the weather here is more pleasant than foreigners imagine. Stockholm receives more sun than many other European cities, including London and Paris. Summers typically average 68 to 77 degrees Fahrenheit (20 to 25 degrees Celsius), especially in July and August. Winters are usually cloudy with rain and snowfall. The average temperatures during winter range from 27 to 30 degrees Fahrenheit (minus 3 to minus 1 degrees Celsius). On average, Stockholm receives around 170 days of precipitation, with much of it occurring in the fall and winter months. The city receives a mix of both snow and rain, with snow occurring primarily between December and March. The aurora borealis can occasionally be observed in Stockholm. Sweden, overall, boasts very considerable snowfall amounts, especially in the northernmost regions where snow covers the ground in a thick blanket for up to six months. Stockholm's more southerly location makes it ideal for those wanting to avoid threatening winter weather. However, strong winter storms can still affect the city, shutting down public transportation and delaying plane flights. Still, if you want to see snow in Stockholm (where storms move in and out quickly and snow sticks around for only a few days) the chance is good in winter. Spring in Stockholm sees gradually longer days and warming temperatures. While there's very little rain, springtime snow is still a possibility. In March and April, there's very little temperature variation, but by May, temperatures are usually extremely pleasant, topping out in the mid-50s or low-60s. What to pack: There may still be snow during spring, so pack accordingly. Bring waterproof shoes and a good jacket. Summers in Stockholm are reasonably sunny with perfect weather conditions for sightseeing and open-air activities. The average maximum temperature in July is a pleasant 68 degrees Fahrenheit (20 degrees Celsius) in the south but can reach scorching heights of 86 F (30 C). A typical summer night will be spent outdoors drenched in sunshine. During midsummer in Stockholm, you can expect daylight to last more than 18 hours, as opposed to a bleak six hours in the heart of winter. The most popular time to visit Stockholm is undisputedly in summer when the weather is mild and warm and the locals take to the streets. Going for a swim in the middle of the city is a special treat, along with island hopping trips. Needless to point out though, the time of year will determine how you will experience Sweden and the capital. What to pack: Pack your bathing suit, as well as shorts, sandals, T-shirts, skirts, and good walking shoes. Many locals will argue that the best time to visit is during late spring and early autumn when the weather in Sweden is mild, the light soft, and tourists are few and far between. You can expect average temperatures of 55 to 60 degrees Fahrenheit (13 to 16 degrees Fahrenheit) and approximately nine hours of sunlight. What to pack: Fall is Stockholm's rainiest season of the year, so be sure to carry an umbrella or a good waterproof jacket. You'll also want some warm sweaters and clothing that can be layered. The harsh Scandinavian winter will last from October to April, depending on the region you find yourself in. The winters in the south are milder and much more bearable. Temperatures will range from 23 to 35 degrees Fahrenheit (minus 5 to 2 degrees Celsius), but have been known to drop below 5 F (minus 15 C). The lowest temperature for Sweden was recorded 100 years ago when temperatures reached a mind-numbing minus 23 degrees Fahrenheit (minus 31 degrees Celsius). However, it has not dropped below minus 13 degrees Fahrenheit since that record. Snowfall usually occurs in December, and the north will experience some serious snow-rich winters with depths around 40 centimeters. The far south, on the other hand, can only expect rain. Winter travel is somewhat restricted in certain areas, and the smaller towns go into a hibernation-like state. However, don't knock the Stockholm winter. It definitely has a certain charm to it as the city is turned into a picturesque fairytale town. Go skating on the frozen lakes and waterways, and best of all, experience the Christmas cheer that is so unique to Scandinavia. Remember, Swedes themselves enjoy a good holiday, and the entire city can shut down for a couple of days over Christmas and midsummer, so keep that in mind when planning your trip. What to pack: Regarding clothing, light to medium weight articles will do just fine for summer months, but for those traveling from countries closer to the equator, bring proper heavyweight jackets and coats for winter. Packing a raincoat is also well advised, regardless of the time of year you travel. North of the Arctic Circle, the sun barely sets in summer, and night seems unending in winter. This phenomenon creates what is known as Midnight Sun and Polar Nights. During the time of Midnight Sun, you can often see the sun at midnight and, most definitely, will experience daytime light all night long. So, draw your blackout curtains should you need some shut-eye. During Polar Nights, conversely, nighttime skies exist even in the daytime, making indoor lighting a must and flashlights and headlamps a necessity for getting around outside.